Kooltronic, Inc., of Pennington, NJ, announced the introduction of the Profile Series 33 & 47 Panel Mounted Air Conditioners designed to cool the interior of electronic cabinets. With capacities ranging from 4,000 to 8,000 BTU/H, these two NEMA 12 and 3R rated units, as well as the Profile Series 43 (released in early 2005), are ideal for both indoor and outdoor applications. 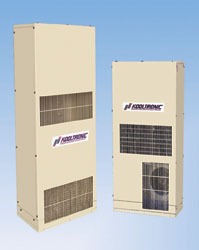 Engineered to be mounted either outside or inside of an enclosure, the Profile Series Air Conditioners are the first Kooltronic models to offer this degree of flexibility. With a depth of only 8 inches for the DP33 and 9 inches for the DP47, the Profile Series are the thinnest indoor/outdoor air conditioners Kooltronic has ever developed. The narrow depth allows the option of internal mounting, making the units tamper-proof. The durability of the Profile Series units makes them a tamper-resistant option for external applications. The Profile Series consists of eight air conditioners ranging in heights from 17 to 60 inches and capacities from 2,000 to 26,000 BTU/H, and are available in 115 VAC and 230 VAC (50 or 60 Hz). Also available in 480 Volt, the Profile Series is UL/CUL Listed and uses environmentally-friendly CFC-free R134a refrigerant.